(Photo: REUTERS / Kham)Vietnamese Catholics hold candles while praying for the release of farmer Peter Doan Van Vuon and relatives, before their trial next week, during Easter mass at Thai Ha church in Hanoi March 31, 2013. The case of Vuon's family in Vietnam's northern Hai Phong port city, who used landmines and guns to stop local officials from seizing their land in January 2012, has sparked rare open criticism of the authorities' strong-arm approach. Six police and soldiers had been injured in the clash, and four people - farmer Van Vuon, his brother and two other relatives - were arrested. The banners read, "Justice and trust for Doan Van Vuon's family" (bottom) and "Doan Van Vuon did not kill." Australia is experiencing an influx of Catholics fleeing Vietnam due to persecution this year, the International Christian Concern group is reporting. Australian Immigration Department figures show a 30-fold increase of Vietnamese seeking asylum in the country. This week a boat of 84 people, mainly Vietnamese, was intercepted 50 kilometers (30 miles) off the Australian coast and brought ashore. The Australian Broadcasting Corporation, the national broadcaster, reported conflicting figures concerning how many refugees arrived in Australia from Vietnam last year. One report listed that the number was fewer than 50, while another indicated 460 had arrived by boat. In any case, the number of asylum seekers has skyrocketed to 759 in 2013. "I guess I'm a little surprised, but it has been pretty obvious over the past couple of months that there have been increases in the number of people from Vietnam," said Ian Rintoul of the Refugee Action Coalition. "[That is] the result of the crackdown, on the underground Catholic Church in particular, in Vietnam." The founder of VOICE (Vietnamese Overseas Initiative for Conscience Empowerment) Hoi Trinh said Vietnamese refugees were increasingly turning to Australia and neighboring South-East Asian countries for asylum, the ABC reported from the Northern Territory capital, Darwin. "If you follow the news lately you'll see there's an increase of oppression by the communist forces in Vietnam" Trinh told ABC Local Radio. "Two days ago two student activists were jailed...there's an increased oppression ever since 2007-08 when Vietnam joined the WTO (World Trade Organization)." Trihn also cited attacks on people of faith as the cause of the exodus of people from Vietnam. "There is increased persecution of people in Vietnam for religious reasons - Protestants are being persecuted - some just fled to Thailand," Trinh said. On July 23 a court in Vietnam will decide on the case of 14 young Catholics who have been imprisoned, he said. The Catholic activists were arrested for opposing the Communist Party, motivated in part by their faith, according to the Catholic Asia News. Two of them have staged hunger strikes to protest abuse in prison. International human rights groups and several nations have focused on their cases and called for their release. Tri Vo, the president of the Vietnamese Community in Sydney, told The World Today of the conditions in Vietnam and why people are leaving. "It's most probably due to the increase in the oppression and suppression of the people in Vietnam and the recent crackdown of the human rights activists, bloggers, media people and young people who are not afraid of speaking up, who demand democracy," he said. "The Communist Party retains supreme control of all state policy and activity, and the government and military are both tied closely to the party. "Strong authoritarian rule brooks no dissent, especially not from ethnic or religious minorities. As a result, human rights violations continue to accrue." Though Vietnam's constitution provides for freedom of worship, the government continues to restrict organized activities of many religious groups. Only government-controlled religious organizations are allowed. Unregistered churches and ethnic minority Christians still suffer harassment, discrimination and, sometimes, outright persecution." The Catholic Church has been present in Vietnam for hundreds of years, and also has a long history of martyrdom. Asia News noted that between the 17th and 19th centuries there were hundreds of thousands of martyrs. According to the National Catholic Reporter, many anti-Communist Catholics went south when Vietnam was divided in 1954. After reunification at the end of the Vietnam War in 1975, the Communist government viewed Catholics with suspicion. Vietnam seemed to loosen restrictions on religious groups, including Catholics, during the first years of the new century. In 2005, The Washington Post interviewed a Catholic priest about the new freedom he had to conduct worship. Rev. Joseph Tran Van Khoa said at the time, "Life for the Catholic Church is a lot easier now. But I know that we have a really long way to go." However, the situation in Vietnam in recent years for Catholics and other Christians has deteriorated. Father Peter Nguyen Khai, a 41-year-old Vietnamese priest living in Rome, told the Catholic News Agency in 2011 that his brethren in his home country were suffering. He said his exile had deepened his "love and devotion to the causes of my Catholic brothers and sisters back home who still struggle and suffer every day for their faith in a ruthless regime." Khai said, "The government uses all forces at their disposal, including the state media, the political apparatus, the laws and the public education system to stop the growth of the Catholic Church at all costs. "Catholics in every part of Vietnam are considered second-class citizens, deserving discrimination in legal treatment." Catholic Hmongs believers were among the scores killed in 2011 Vietnam People's Army during peaceful rallies that took place in May of that year. The rallies were organized in part in order to celebrate the beatification of Pope John Paul II. In March of this year, the U.S.-based Center for Public Policy Analysis (CPPA) noted the continued plight of Christians in Vietnam and neighboring Laos. 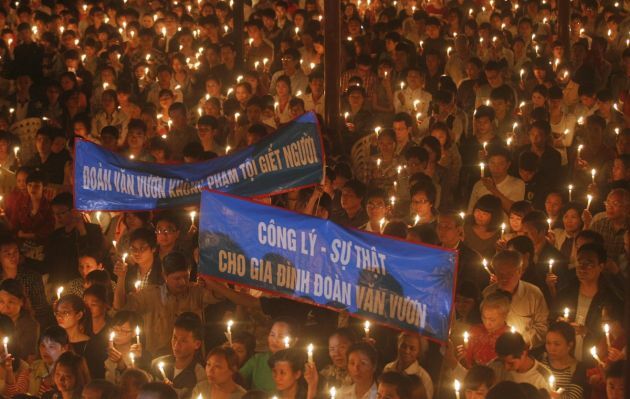 "There is no Easter in Laos and Vietnam for numerous Christians, and other minority and dissident religious believers, who have simply disappeared or have been persecuted, or killed, at the hands of the military, security forces and secret police," said Phillip Smith, Executive Director of the CPPA in Washington, D.C. There are presently 5.6 million Catholics in Vietnam, almost 7 percent of the population. The Vietnamese Catholic Church is the fifth largest in Asia.